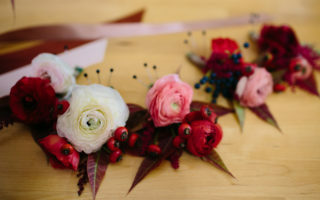 First up, of course, gather your necessary materials: thick floral wire, thin floral wire, floral tape, scissors, floral shears, wire cutters, flowers and other elements (fruit/berries, vines, greenery, feathers, twigs). While the actual steps above are more or less self-explanatory, Emily had a few extra tips for keeping the process simple, or for modifying this tutorial if you want to add more elements. Supplies: You might think that with a crown you should use the standard (thin) floral wire you see in the floral aisle as the base, but nope (though you should still buy that, you’ll need it for later). Emily suggests using 12-gauge (4.6 mm) or thicker aluminum wire, which you can get at a craft store, like JoAnn, or a floral supply store, or online. Another option is plastic-coated garden or landscaping wire, again 12-gauge at minimum for shape and pliability. Choosing Your Flowers: Don’t be intimidated by flower choice here. Just about anything looks good on a floral crown. For some crowns, like the one above, Emily chose a variety of flowers in different textures and colors. But for others, she went softer, using baby’s breath and a more monotone palette. You don’t need a ton of flowers to make your flower crown, so don’t be afraid to buy more than you need and experiment with different styles. Using Greenery: The above crown was made without any greenery, but maybe you want to add a little texture to the base of your crown before adding your flowers. Or maybe you want a less floral altogether, for the wood nymph look. No problem. 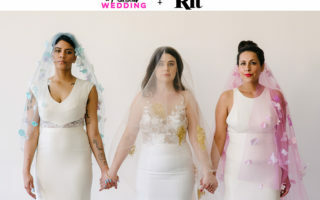 The only difference if you are using greenery around the main wire is that you are going to secure it using small amounts of thin green floral wire instead of floral tape. You will then secure the rest of the flowers to the crown using thin floral wire as well. Arranging The Flowers: When you’re arranging your flowers, start just to the side of center, leaving a gap in the middle (which will become your center focal point). Make sure to arrange all your flowers so that they are facing the same way. Once you’re done with the sides, decide on an element to use as your central focal point. Will it be one larger flower or two (one on each side of the crown)? Add the center point, making sure to secure it well. Floral wire is very bendy and can be wrapped around and through things. After you have your central piece, go back and fill in any gaps with additional smaller flowers or other elements. Finishing The Ends: To finish the ends, you have a few options. You can secure them either with basic wire or floral tape. You can cover the ends with ribbon (if so, wrap ribbon around wire or tape and secure with hot glue). Or you can add one last flower to the end, having it face the opposite direction so it covers the exposed stems. Finally, secure the crown around your head using bobby pins and voila! You look effortlessly cool, and it probably took you less than half an hour to do so.